Fire alarms, also known as smoke alarms, are devices which detect fire, smoke and heat and then sound an alarm as a warning. They can be fitted to either the ceiling or a wall and allow you extra time to escape. Without a fire alarm fitted in your home, you might not know a fire has broken out, which puts your life at greater risk. In England there were 30,322 domestic dwelling fires attended to in 2016/17. 27% of those dwellings did not have fire alarms and 20% had fire alarms, but they did not operate. It’s extremely important that you ensure you not only have a fire alarm fitted in your home, but that it is operating. There are a variety of fire alarms to choose from for your home, however, they all work to detect fire, smoke and heat differently. You should be careful to choose the right alarm for the right location to avoid false alarms. Ionisation alarms contain specific ionisation sensor chambers, which detect small particles of smoke which is usually produced by a fast burning flame, such as fabric commonly found in the bedroom. Only when enough smoke particles have entered the ionisation chamber, will the alarm sound. Ionisation alarms are best located in a bedroom, this is because they can be prone to false alarms and oversensitivity, such as fumes found in the kitchen. Optical alarms are very common in households and suitable for most locations in the home. They work by using optical sensors and an infra-red beam that detects smoke quickly. They will detect most fires, including slow burning fires and are not oversensitive either, so are less likely to cause false alarms. They are best located in hallways, living rooms, landings, bedrooms and dining rooms. Heat alarms operate differently to smoke alarms, as they only detect extreme changes in the temperature of the room using a built in thermometer. When the alarm detects a sharp increase in temperature, similar to that which you would get with a sudden, fast burning fire, it will sound an alarm. They are ideal for kitchens as the trigger temperature is above the average temperature a kitchen reaches when cooking, so they are less likely to cause false alarms. Heat alarms should only ever be used in the kitchen. Multi sensor alarms can react to all types of fires, quickly and efficiently. They combine multiple kinds of sensors, including optical and heat, to create the ideal combination to protect your home. However, despite a multi sensor alarm including heat alarms, it should still never be used in the kitchen; you should only use heat alarms in the kitchen to reduce the chance of false alarms. They are best suited for hallways, landings, dining rooms, bedrooms. The UK Government currently recommends that all fire alarm systems installed should follow the relevant British Standard BS 5839. Guidance given in the BS 5839 code of practice is suggested as the minimum standard to follow for both domestic and non-domestic buildings. BS 5839-1 ‘Fire detection and fire alarm systems for buildings. Code of practice for systems design, installation, commissioning and maintenance’ gives guidance and recommendations for both existing non-domestic premises and new build dwellings. BS 5839-6 ‘Fire detection and fire alarm systems for buildings. Code of practice for the design, installation and maintenance of fire detection and fire alarm systems in dwellings’ gives guidance and recommendations for all dwellings, including existing. These British Standards are the current “codes of practice” for installers, architects and designers to follow. They have been put in place as best practice guidelines in order to minimise the loss of life. Homeowners too can use these British Standards as guidelines for their own homes, to find out what is currently being recommended as the safest measure to protect their homes. When stated within the regulations, a dwelling counts as a bungalow, multi-storey house, mobile homes, shared houses, individual flats. To see a full list of dwellings, please refer to BS 5839-6. Within BS 5839-6, there are minimum grades and categories set out for fire alarm systems in different types of domestic dwellings. The Grades mentioned in BS 5839-6 relates directly to power supply of the fire alarms. Grades range from A – F, with the higher the grade, the greater the protection you have in the event of a fire. For example, a Grade A system will require mains power supply with a dedicated fire alarm panel and a battery back up supply of at least 72 hours, and a Grade F installation is simply one or more battery powered smoke alarms fitted inside the dwelling. Existing dwellings and new dwellings will also have different Grades applied to them, for example existing dwellings (not used for rental accommodation) are the only type that is suitable for a Grade F system. The categories mentioned within BS 5839-6 relate to the coverage of the detectors within the dwelling. Categories for dwellings range from LD1 (being the highest protection of life) to LD3 (being lowest protection of life). To clarify, LD would stand for protection of life when referring to a dwelling. Take a look at the infographic below, which goes through the various grades and categories to find out which one applies to your dwelling. Fire safety across the UK coincides with BS 5839 Code of Practice; however, England and Wales, Scotland, and Northern Ireland each have their own documents and guidelines to follow as well. Included in these documents, there is also guidance on types of alarms to use in your home and the areas to install them in, to ensure maximum coverage. We advise always to follow the guidelines and documents for your area. Below are examples of the minimum protection standard for domestic properties (up to three storeys and floor levels no larger than 200m²). Approved Document B has been put in place for England and Wales and covers new builds, loft conversions, and some extensions. This document states that all new dwellings should be equipped with a hardwired and interlinked fire alarm system with battery back up that meets the minimum recommendations stated in BS 5839-6, meaning at least a Grade D Category LD3 standard. This includes at least one alarm in all circulation areas such as hallways and landings as the minimum protection. To find out more about smoke alarm regulations and guidelines in England and Wales, click here. England and Wales advises that all installations should at least meet requirements set out in BS 5839. Fire safety in dwellings in Scotland is set by 2013 Building Standards Domestic Technical Handbook. They require hardwired and interlinked alarms, with at least one smoke alarm in every commonly used room such as a living room, at least one alarm in circulation areas such as hallways and landings, and a heat detector in the kitchen. These requirements are equal to a Grade D Category LD2 standard. To find out more about fire alarm regulations and guidelines in Scotland, click here. Scotland advises that all installations should at least meet requirements set out in BS 5839. Northern Ireland has Technical Booklet E: 2012 in place, which has similar requirements for smoke alarms in dwellings as the Code of Practice BS 5839. It requires hardwired and interlinked smoke alarms in commonly used rooms such as a living room, at least one alarm in circulation areas such as landings and hallways and a heat detector in the kitchen. These requirements are equal to a Grade D Category LD2. To find out more about fire alarm regulations and guidelines in Northern Ireland, click here. Northern Ireland also advises that all installations should meet requirements set out in BS 5839. 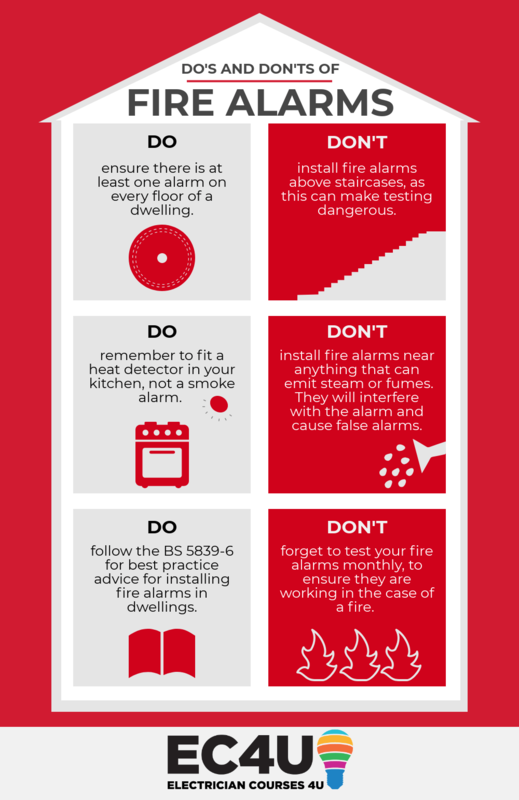 Within BS 5839-6, detailed guidance is given on where to best install fire alarms in the home, along with dedicated grades and categories for certain types of dwellings. Typically, you will be required to position a fire alarm in circulation areas between bedrooms and also where a fire is most likely to break out, such as kitchens and living rooms. There should a smoke alarm fitted on every storey of the dwelling and within 7.5m of doors to every habitable room. Regulations state that if alarms are ceiling mounted, they must be at least 300mm from walls and light fittings and you should be able to reach an alarm safely, in order to carry out regular testing and maintenance. For this reason, it is not recommended to install smoke alarms over any stairs. To avoid false alarms, it’s recommended not to install fire alarms near or directly above air conditioning units, cooking areas, or in bathrooms, as they can emit steam or fumes that can interfere with the alarm. Current BS 5839-6 Code of Practice states that all fire alarms in the dwelling should be interlinked. This is because you can be alerted of smoke or fires much earlier than if they were not linked, as when one unit sounds an alarm, the rest of the alarms will be triggered too. For example, a heat alarm can go off in the kitchen and trigger the smoke alarm upstairs in the bedroom to go off as well. If you choose to have an interlinked fire alarm system installed in the dwelling, you should ensure that the power comes from the dwelling’s main electricity supply. Interlinked or radio linked alarms should all still have a battery back up, which can supply up to 72 hours power in the event of any power cuts. When installing an interlinked fire alarm system in a dwelling, they should be installed onto a regularly used lighting circuit. The reason for this is so that you will be alerted more quickly should the power trip and the lights go out. If you were to install interlinked fire alarms on their own circuit, you may not notice if they trip, and once the battery back up runs out, you will be left unprotected until you notice the circuit has tripped. It’s recommend that you test the alarms in a dwelling every month, replace the backup batteries every year and replace the alarm itself every 10 years. Every 6 months you should also dust your fire alarms so the sensors do not get blocked. Do you know what Part P is? Do you know what’s inside your consumer unit? Get clued up on the Building Regulations and electrical safety within your home now with our Electrician Awareness Guide for Homeowners!